This post brought to you by Jack Daniel’s Tennessee Honey. All opinions are 100% mine. Summer is the perfect season for living life to the fullest and enjoying fabulous new experiences. Imagine letting fear, or FOMO, influence you living your dreams, trying new things and having the greatest summer experiences. That doesn’t sound very awesome, now does it? Summertime is the source of most of my FOMO moments. For those of you that have no idea what a FOMO moment is, let me tell you. The Fear of Missing Out, the idea of missing a great beach party, an epic sunset, or a great sighting of sea life give me FOMO moments and keep me going no matter how tired I might be, or how busy my life is at any particular moment. I’ll be spending most of my summer traveling; we leave Saturday for a week-long cruise to the Caribbean, then it’s off to North Carolina for a week of peaceful solitude – and riding the curviest road in America, Deal’s Gap. They don’t call it the Dragon’s Tail for nothing – it’s harrowing! But I’m going to do it on the back of Chris’s bike and love every minute of it, after I get over my initial fear of heights and motion sickness. Because I have the fear of missing out! I don’t want to miss a single moment of excitement! Jack Daniel’s Tennessee Honey is a blend of Jack Daniel’s Tennessee Whiskey and honey liqueur, just a little bit of honey, and a whole lotta Jack. The makers of Jack Daniel’s are big believers in living life to the fullest, and they’ve launched a great summer promotion called Jack Daniel’s Tennessee Honey Summer Swarm promotion. Jack Summer Swarm photo promotion is all about sharing the excitement of your amazing summertime experiences that you just can’t imagine letting slip past you. All you have to do to enter is share your original photos of your most awesome FOMO moments for the chance to win the Ultimate Summer Trip – a $5000 travel voucher to plan exactly where, when, and how you want to travel! 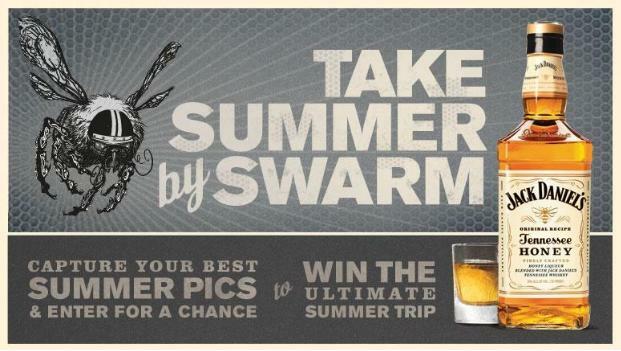 You know I’m all about the travel, and I am definitely entering the Jack Summer Swarm contest myself!! The winning photo is partially selected by popular vote, so be sure to share with your friends and get them to vote for your entry! Each week there are prizes up for grabs for voting and submitting photos in addition to the travel voucher prize, so there are plenty of opportunities to win something! I hope that you’ll enter the Jack Summer Swarm photo promotion and share your most unforgettable summer firsts – don’t forget to use the hashtag #summerswarm – and I bet that if you try Jack Daniel’s Tennessee Honey you will come up with a few new favorite summer drink recipes like maybe a Honey Julep or a Jack Honey Sweet Tea! I completely agree! You should live life to the fullest! That’s a great way to live….to the fullest! I can’t believe you’re gonna take that whole trip by motorcycle. You’re brave! How fun that you are going to be traveling so much! I wish I could travel all summer long. That would be awesome. Maybe one day when my kids are all grown up. I give you credit, there is no way I could handle a mototbike tour! I’m scared to death of them. I can’t wait for your stories and photos, though! Have a wonderful summer. Be safe! Whiskey is one of the few hard liquors I will drink, and the addition of honey sounds great. Sounds like you have a fun summer planned. Ooooo — that travel voucher would be awesome! What a great summer vaca you guys have going on. Have fun on your motorcycle trip! I would love to go swimming with dolphins! Whiskey with honey! Sounds great! Have fun on your road trip. Oh my goodness, I need to get out of the house more. I love that you went swimming with dolphins and Whiskey and lime is one of my favorite cheats. That is so aweseom that you got to ride dolphins! I need to remember not to let fear get in my way! What an exciting summer!! Have fun! cool, and I love honey. Love those pictures, especially you with the dolphins. Gosh those pictures are amazing! I loved swimming with the dolphins! I agree! You only get one life, so do it ALL! I hope you have an amazing and safe time while traveling. I am definitely doing everything I can to live this summer to the fullest with my boys!